She is the Farrow sister who neither had a Beatle write a song about her, nor was impregnated by the devil. 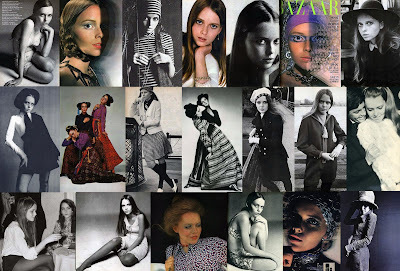 While Mia and Prudence were chilling in the ashram, Stephanie Farrow was modeling for magazines like Harper's Bazaar and posing as the face of Biba. Born in 1949, she is the second youngest child of seven children (in this order: Michael, Patrick, Mia, John, Prudence, Stephanie, and Tisa) to film director John Farrow and actress Maureen O'Sullivan. As a teenager in the late 1960s, she became one of the favorite young faces of Barbara Hulanicki, who placed her in many Biba advertisements and catalogue shoots. She continued her modeling career with much success throughout the next decade and a half, until turning to acting in 1983 in the film Zelig. In addition to Zelig, Stephanie has played the sister of Mia Farrow's character in another woody Allen film The Purple Rose of Cairo, one of my personal favorites. It's fun to watch the two Farrow girls onscreen together; in addition to their striking physical similarity, they share a quiet delicate way of speaking that flows at the same rhythm.